The Italian word chiaroscuro, which refers to contrasts of light and dark in a work of art, came to be applied to woodcuts in which figures were delineated in dark ink on a background of varying tones of the same or similar colours, with un-inked white areas of paper providing the highlights. Chiaroscuro woodcuts are built up of two or three blocks and the colours tend to be closely related because the emphasis is on the depiction and differentiation of tonal values rather than the effect of bright colour. In the print depicting Pluto, Goltzius used three different blocks (black, dark grey and pale grey), which were printed successively on one sheet of paper; the black outline was printed last so that it would sit crisply on top of the colours. Great concentration and skill was required for the registration of the printing blocks in order to attain the desired result. Although they represent only a small part of his oeuvre, the chiaroscuro woodcuts designed by Goltzius rank among the most sophisticated and impressive examples of the medium made in northern Europe during the 16th and 17th centuries. Pluto and Proserpine (229.1983) belong to series of seven oval-format chiaroscuro w)oodcuts representing gods and goddesses; six of the prints can be further divided into three pairs, representing the deities of the sea, heavens and underworld. 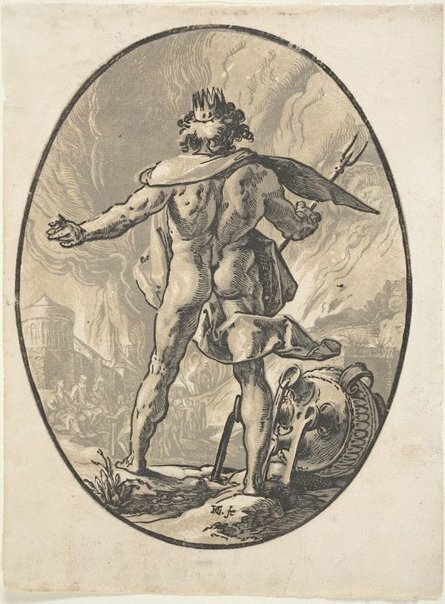 Pluto, who ruled over the land of the dead, is shown from behind surveying his kingdom of Hades, the soaring flames of which are visible in the background. At his feet the rivers of the underworld spill from the mouths of an upturned urn. To the left, a procession of souls of the dead passes before Pluto’s palace to meet the three infernal judges. Pluto abducted Persephone while she was gathering flowers in a glade in Sicily and carried her off to the land of the dead to be his wife. Jupiter interceded to have her set free but because she had eaten pomegranate seeds while in Hades, she was forced to spend part of each year back in the land of the dead. While she is absent from the world, in autumn and winter, vegetation dies; in spring and summer, when she is free to live on the earth, nature regenerates and flourishes. In Goltzius’s print Persephone is depicted perching weightlessly on a rock with her body impossibly twisted into a graceful serpentine curve. Her habitat is a landscape of floral and vegetal abundance, befitting the goddess of fertility. Signed l.c., [incised block] "HG.fe [artist's monogram]". Not dated. Renée Free, AGNSW Collections , 'The Western Heritage, Renaissance to Twentieth Century', pg. 108-172, Sydney, 1994, col illus p 113. Prints & drawings Europe 1500-1900 , Sydney, 2014, p 40, col illus p 41, col illus p 42.